We’ve blogged before about Messiah College’s iconic covered bridge. Messiah College has the the last traffic-bearing covered bridge in York County on its campus. Well, it crosses the Yellow Breeches, the boundary of York and Cumberland counties, to at least touch the bank in York County. 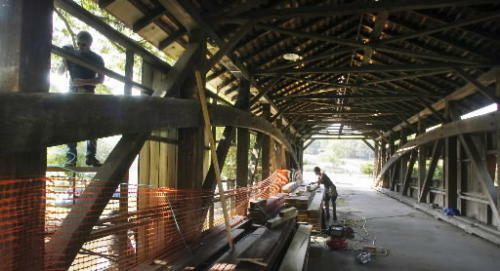 It’s undergoing renovations so it can keep the status of York County’s only covered bridges.